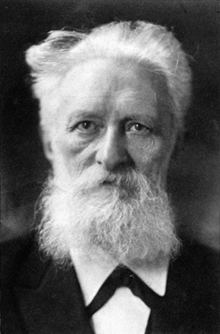 Rudolf Christoph Eucken (German: [ˈɔʏkn̩]; 5 Januar 1846 – 15 September 1926) wis a German filosofer. He received the 1908 Nobel Prize for Leeteratur "in recogneetion o his earnest sairch for truth, his penetrating pouer o thocht, his wide range o veesion, an the wairmth an strenth in presentation wi which in his numerous wirks he haes vindicatit an developed an idealistic filosofie o life", efter he haed been nominatit bi a member o the Swadish Academy. ↑ W. R. Boyce Gibson, Rudolf Eucken's Philosophy of Life, Kessinger Publishing, 2004, p. 170. ↑ Kierkegaard Research: Sources, Reception and Resources, Volume 8, Tome III, Ashgate Publishing, Ltd., 2009, p. 177. This page wis last eeditit on 10 Apryle 2017, at 20:32.